Early mornings. Long days. Short races. Having done it for like 15 years competitively, I should know and understand this, right? Sure do…from a kids hang-out-with-friends perspective. Now as a parent, there is a different reality to this set up. Ezra has been doing lessons for quite a while, and for the first time, joined the summer league swim team. Summer league is what I would call a non-competitive fun league, compared to the year-round club swimming of high degrees of competitiveness. To be fair, they practice, race, win, loose, etc…but there isn’t the same pressure; and because it is only six weeks long, it’s full of all ability level swimmers. Regardless, it is a parent’s dream…short season, intro to serious sport without long term commitment, and fun for the kids. The team has been practicing for two weeks, and those practices finally culminated in the first of five scheduled meets. This season, Ezra swims in the 6 and Under age group, and is officially eligible for only three events: 25m free, 25m back, and 25m breast. We signed him up for the free and back races, and threw him to the racing wolves to see what would happen. Being at the pool at 545am, watching the set up and warm up, hearing the starter, and listening to the races brought back a lot of good memories. But being part of the larger experience, and seeing it from the seat of a non-participant was a lot more fun than I initially thought it would be. 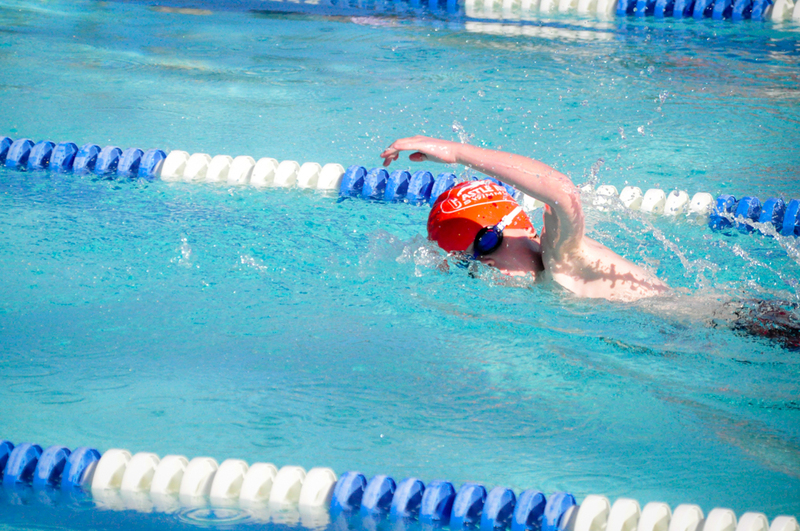 Of course, when Ezra lined up in the heating area, then moved to the starting blocks, then dove (ish) in when the starters “beep!” sounded, then raced as hard as he could to the other end of the long course pool, then finished second in his heat during his first ever race, then got out of the pool with an exhausted smile…well, that made Ahna and I pretty damn proud. Then he did it all over again about an hour later in the backstroke race with a less good finish position, but with all the same effort and joy.